The absolute majority of those writing against the Gozo tunnel project are either Maltese or guests living in Gozo. I say this because they stand firm against the proposed project. They want life to remain still. Generally speaking, one may agree with their view because who would not like tranquillity, peace and harmony? Most of these ‘permanent’ or ‘part-time’ residents would have bought property in Gozo because of the quiet and rural way of life. If things change, their idea of Gozo and their investments are likely to change too. That’s one way of looking at this very important issue. On the other hand, the commuting Gozitans adopt a very different approach to the project. Of course, not all Gozitans agree because there are those who prefer the status quo too. These Gozitans either have no business contacts on the mainland or no children working in Malta. One has to take into account there are about 7,000 Gozitan workers in Malta, according to the latest statistics, and about 1,200 Gozitans students studying at the University. These would have to wake up before 5am, catch a bus or use own transport to get to the ferry in time for the early morning crossings. At Ċirkewwa, they usually find that the buses left exactly on time according to schedule. Gozitan commuters are livid, having to wait another 30 or 45 minutes for the next buses. This is sheer waste of time and unnecessary stress as workers and students arrive late at their place of work or at the University. This is also a reality. The Gozo Ministry has long been aware of this very acute problem and, now, action to address it is in the pipeline. At least, that is how I know it. Introducing bus services for Gozitans according to the ferry crossings, which can also cause problems in case of unscheduled trips, could cost over €2.5 million to implement. Is it worth it? Of course, it is. Maltese workers may sympathise with their Gozitan colleagues when they arrive late or have to leave early occasionally to catch the bus but when this keeps happening they do grumble and complaint among themselves. Gozitan workers are aware of this and they too are not happy about it. But nobody can be blamed. Then there are the enormous financial difficulties that Gozitans face when studying or working in Malta. The costs keep rising as time goes by. Parents have to fork out hundreds of euros every month in accommodation, food and travelling expenses. If Gozitans working in Gozo get a promotion, they have to cross over to Malta. If, say, this means a monthly wage increase of €100, this rise is offset by having to pay lodging costs in Malta, higher food expenses because they would have to buy food for themselves and also their family in Gozo. The end result is likely to be having to spend more than the actual pay rise. I know many Gozitans who refused promotions for these reasons, apart from spending years away from their families. Those wanting time to stand still in Gozo and are against the tunnel do not consider these issues but only think about themselves. It is mostly because of these reasons that I consider the tunnel project to be a positive move. There are two aspects I would like to raise. First, the tunnel can form part of the planned underground transport system, similar to those found in Central Europe. Gozo will remain as it is and as we now know it. Personally, I think there should be an underground system between Gozo and Valletta. If, on the other hand, the tunnel will be open to vehicles, it will still solve most of the difficulties encountered by Gozitans. It will cut travel time and, more importantly, connect Gozo with the outside world. If the first option is preferred, vehicles, whether driven by tourists or locals, can use the ferries. Two new ferries, not one, should be added to the present fleet urgently. 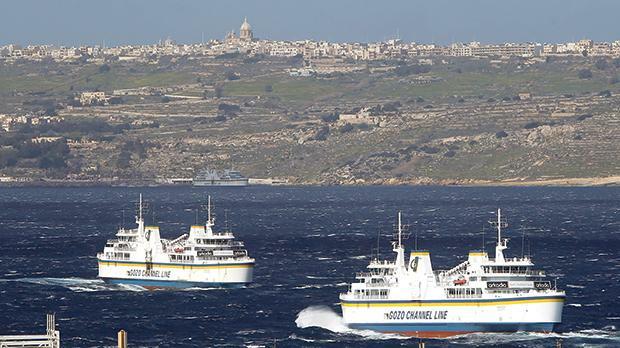 The problem is that there is no berthing space in Gozo to take another ferry, let alone two. In Mġarr, there is a quay that can be used by a cargo ferry equipped with side ramps, as the old ferries used to have. Thus, a second ferry can berth if the quay is extended. Like many others, I too have dreams. I dream of an innovative project that can probably solve many Gozitans’ problems. In 1955-19566, the Balogh Commission had made three proposals for Mġarr harbour: small, medium and large breakwater arms. The small one had been chosen because nobody had envisaged the workload the Gozo harbour would have to handle in the future. For quite some time now, I have been thinking that if Mġarr harbour is enlarged considerably by having two larger breakwater arms, one from Xatt l-Aħmar, in Mġarr and the other before one reaches Ħondoq ir-Rummien, in Qala. This way, both beaches will be protected. These will serve different purposes and solve many problems. Land reclamation will enlarge Gozo extensively. The cruise liner terminal can be built there. Multiple super yacht berthing places can be available. Rock and rubble excavated from the tunnel and other projects can be used to form the breakwater arms. Underground facilities can be built to store yachting equipment when the owners are away. Parking facilities can also be provided underground. Yachts can provide more than enough working opportunities for Gozitans. Not only will there be ample work for Gozitans but other personnel will also be required. The present inner harbour can again be used by Gozitan fishermen, small craft taking tourists on cruises and small boats owned by Gozitans. Alternative new roads leading from Mġarr to other places can be built as I had done, widening the Mġarr main road leading to Għajnsielem/Victoria. The point I make is that a tunnel, if and when constructed, can serve to better connect Gozo with the mainland and the outside world.